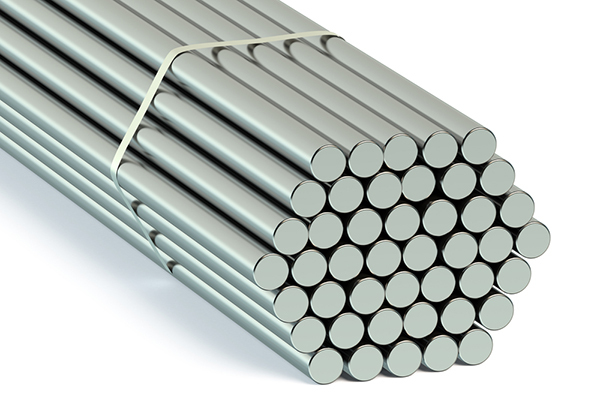 Our stainless steel round bar is generally sold in the annealed condition, although some grades such as 17-4 or certain 400 series grades may be hardened by heat-treating. The standard length for most size round bars is 12’-14’ random lengths, but lengths are available in some sizes up to 20’ and longer. Finishes on bars can vary and include cold drawn, centerless ground, smooth turned, rough turned, turned ground and polished, and HRAP. Available Steel Grades: 304/304L, 316/316L, 302, 303, 309, 310, 321, 330, 347, 410, 416, 430, 600, 625, 718, 15-5, 17- 4, 17-7, A286, 2205 and more! DFARS or domestic material available in a variety of sizes. RB-1/16″ Stainless Steel Round Bar	 1/16"
RB-.072″ Stainless Steel Round Bar	 .072"
RB-.093″ Stainless Steel Round Bar	 .093"
RB-.110″ Stainless Steel Round Bar	 .110"
RB-5/32″ Stainless Steel Round Bar	 5/32"
RB-3/16″ Stainless Steel Round Bar	 3/16"
RB-.192″ Stainless Steel Round Bar	 .192"
RB-7/32″ Stainless Steel Round Bar	 7/32"
RB-1/4″ Stainless Steel Round Bar	 1/4"
RB-.255″ Stainless Steel Round Bar	 .255"
RB-9/32″ Stainless Steel Round Bar	 9/32"
RB-5/16″ Stainless Steel Round Bar	 5/16"
RB-.318″ Stainless Steel Round Bar	 .318"
RB-3/8″ Stainless Steel Round Bar	 3/8"
RB-7/16″ Stainless Steel Round Bar	 7/16"
RB-15/32″ Stainless Steel Round Bar	 15/32"
RB-1/2″ Stainless Steel Round Bar	 1/2"
RB-17/32″ Stainless Steel Round Bar	 17/32"
RB-9/16″ Stainless Steel Round Bar	 9/16"
RB-5/8″ Stainless Steel Round Bar	 5/8"
RB-11/16″ Stainless Steel Round Bar	 11/16"
RB-3/4″ Stainless Steel Round Bar	 3/4"
RB-13/16″ Stainless Steel Round Bar	 13/16"
RB-7/8″ Stainless Steel Round Bar	 7/8"
RB-15/16″ Stainless Steel Round Bar	 15/16"
RB-1″ Stainless Steel Round Bar	 1"
RB-1-1/16″ Stainless Steel Round Bar	 1-1/16"
RB-1-1/8″ Stainless Steel Round Bar	 1-1/8"
RB-1-3/16″ Stainless Steel Round Bar	 1-3/16"
RB-1-1/4″ Stainless Steel Round Bar	 1-1/4"
RB-1-5/16″ Stainless Steel Round Bar	 1-5/16"
RB-1-3/8″ Stainless Steel Round Bar	 1-3/8"
RB-1-7/16″ Stainless Steel Round Bar	 1-7/16"
RB-1-1/2″ Stainless Steel Round Bar	 1-1/2"
RB-1-9/16″ Stainless Steel Round Bar	 1-9/16"
RB-1-5/8″ Stainless Steel Round Bar	 1-5/8"
RB-1-11/16″ Stainless Steel Round Bar	 1-11/16"
RB-1-3/4″ Stainless Steel Round Bar	 1-3/4"
RB-1-13/16″ Stainless Steel Round Bar	 1-13/16"
RB-1-7/8″ Stainless Steel Round Bar	 1-7/8"
RB-1-15/16″ Stainless Steel Round Bar	 1-15/16"
RB-2″ Stainless Steel Round Bar	 2"
RB-2-1/16″ Stainless Steel Round Bar	 2-1/16"
RB-2-1/8″ Stainless Steel Round Bar	 2-1/8"
RB-2-3/16″ Stainless Steel Round Bar	 2-3/16"
RB-2-1/4″ Stainless Steel Round Bar	 2-1/4"
RB-2-5/16″ Stainless Steel Round Bar	 2-5/16"
RB-2-3/8″ Stainless Steel Round Bar	 2-3/8"
RB-2-7/16″ Stainless Steel Round Bar	 2-7/16"
RB-2-1/2″ Stainless Steel Round Bar	 2-1/2"